A massive weight loss challenge is getting underway in the Culpeper area, and there’s still time to sign up to participate. Registration for the annual Drop It! The Healthy Living and Weight Loss Challenge is going on this week, ending Feb. 2. Participants have the chance to win up to $1,000 in prize money while slimming down and learning more about exercise and nutrition. The 12-week Drop It! program features free exercise classes, nutritional tips, health screenings and motivational support. As part of the program, a health fair will be held Feb. 2 at Germanna Community College’s Daniel Technology Center from 10 a.m.-3 p.m. The fair will include free screenings, fitness demos, healthy snacks and more, according to the “Drop It!” website, dropitchallenge.com. Drop It! is a joint effort of Germanna, the Culpeper Regional Health System and Powell Wellness Center with support from local philanthropists Joe and Linda Daniel. It’s a way to inspire area residents to take better charge of their health. It’s also a fundraiser for local nursing and health education programs, with $50 donated for every pound lost by participants. Student Activities is offering a free leadership mini-retreat for student leaders and advisors at the Fredericksburg Area Campus in Spotsylvania on Feb. 1. Nationally known guest speaker and entrepreneur Tom Krieglestein of Swift Kick will lead the program. Please RSVP to Sandi Pope at spope@germanna.edu by Jan. 31. Just like on a dance floor, every school experiences varying levels of student engagement between those fully involved (student leaders) and those lurking on the edge (apathetic students). The same tactics to create successful social change on a dance floor (connections, relevancy, models of success, and motivation) also work to increase engagement within any school. DFT provides student leaders a new model for creating community, increasing student engagement, and fostering a culture of retention. I lived the first nine yrs of my life on a western Michigan farm. My family then moved to a Chicago suburb where I spent the rest of my childhood. I now live in NYC with my wife, Annie Colbert, and two cats — Oscar and Layla Beans. I consider myself a lifelong explorer who lives to create. I started my first company, an online retail store, as a college junior. At its peak, the store annually grossed $1.5 million. With the revenue I paid my college debt, my post college living expenses, and an eight-month Europe/Asia trip with my wife. I was a 2001 ALL-USA Academic First Team member. I was top of my class at both College of DuPage and Aurora University and gave both graduating speeches. USA Today featured my profile in a full page spread distributed internationally. Since graduating, I worked for three years as a Quantum Learning Network facilitator. QLN is considered the premier company for accelerated learning techniques. Through QLN, I spoke to thousands of students around the US and the world including South Korea, Indonesia and Bermuda. In 2004 I co-founded my second business, Swift Kick, with the goal of increasing student engagement in education. We use both training and technology to accomplish our mission. We've been named the 2007, 2008, and 2009 Best Campus Speaker of the Year by member schools of the Association of the Promotion of Campus Activities. Our two trainings are Dance Floor Theory Leadership Training and The Secrets Behind Facebook. Our technology project is Red Rover, an online student orientation that happens before orientation and integrates with Facebook. My wife, Annie, and I were one of the top three finalists competing for the 2008 NBC Today Show Wedding - Race to the Altar. Germanna Today guests include award-winning author Howard Owen on his new Mystery Writing course at Germanna, Cory MacLauchlin, author of the John Kennedy Toole biography "Butterfly in the Typewriter," and Ben Sherman on Workforce programs. GCC President David A. Sam and speech instructor Shelly Palomino co-host the Germanna Today cable TV show. Owen, the award-winning author of 10 published novels, teaches "A Mystery to Me: The Art of Mystery Writing," a three-day, 7-pm-9pm evening class Feb. 5, Feb. 12 and Feb. 19 at Germanna's Fredericksburg Area Campus for $69. Including the recently released and highly acclaimed mystery novel, "Oregon Hill," Owen draws on his 23 years of experience writing fiction to help students learn the art of mystery writing. He will address such disparate subjects as finding the time to write, plotting, dialogue, character development, descriptive writing, writing with humor as well as editing and rewriting. Students will write at least one mystery short story, which will gently critiqued at the end of the course. To register, call 540/891-3012. It wasn’t that long ago, and Devon Geary has come a very long way. She was so sick in 2006, when she was a sophomore at James Monroe High in Fredericksburg, that she had to drop out of school. She thought she might be dying. If she was, would her doctors and parents tell her? She suffers from postural orthostatic tachycardia syndrome (POTS). The rare genetic disorder can be debilitating. Sitting up or standing can cause heart rates to soar and blood flow to the brain to decrease, resulting in fainting. Worse, Devon's case of POTS is accompanied by Ehler-Danos syndrome, which affects connective tissue between joints and can make movement agonizing. At 16, she was faced with the prospect of being bedridden or in a wheelchair for the rest of her life. Her doctor gave her little hope. In 2008, she came to Germanna Community College in a wheelchair and earned her GED. She began classes at GCC, using a walker and frequently losing consciousness. There was no way I could have gone to a four-year school," Devon said. "I could barely walk. I could barely stay conscious." "I would sometimes find Devon in the fetal position," Win Stevens, GCC's Coordinator of Disability Services said. She was able to stick with it, she said, because at Germanna: "Nobody stared at me. Nobody laughed at me. I had been in a wheelchair for 2½ years. I was used to pity stares. But I didn't get that at Germanna. People were very kind and accommodating, but they didn't pity me." 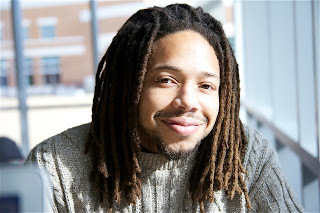 Devon thrived on the kind of one on one attention students receive from faculty at Germanna. Her condition gradually improved, and though there was still pain, by 2010, she not only walked on her own, but became an assistant dance instructor. As a teenager, she had dreamed of a career as a professional dancer. She did so well at Germanna she was awarded nearly a full scholarship to Amherst, one of the top liberal arts schools in the country. 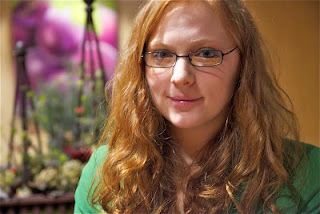 "If anything, I was the 6-foot-tall redhead with the 4.0," Devon said. "I was never defined by my illness there and I really appreciate that. I don't know if it would have been that way at a four-year school," she said. "I think I did pretty well, but it was because of the environment." Now she's 22. She has graduated from Amherst, been chosen as a Amherst-Folger Undergraduate Fellow and will work there as a teaching assistant through the end of the academic year as she prepares to begin graduate school. As part of her fellowship, she will learn about archiving at the Folger Shakespeare Library on Capitol Hill in Washington. It’s the world’s biggest repository of the printed works of William Shakespeare. And she said she's "looked at frontispieces, engravings, and other illustrations in maps, atlases, and books, most of which were about the New World, to see how Europeans depicted the Other in the Early Modern Period––particularly how the English depicted and represented American Indians in images in that time period. It really was amazing." Her recovery has been so dramatic that she said she made the University of Massachusetts Competitive Ballroom Dance Team last fall, although she didn’t compete because she was working on a paper she hopes to see published. “If you’re going to compete, you have to rehearse a minimum of eight to 10 hours a week, if not more,” she said. “In ballroom dancing, it’s two moving as one and everything counts.” She hopes to compete soon, but said she had work to do first. She wrote an analysis of the novel “Whatever You Love” by Louise Doughty that includes work with literary and psychoanalytic trauma theory. Her last week as an undergrad, she submitted 100 pages of her own critical writing, 83 of which belonged to her paper on “Whatever You Love,” which she calls a “thesis-ish” and which she continues to refine in hopes of getting it published. She saw herself in it, she says, because POTS took away the things she loved when she was younger, before she fought her way out of a deep hole of pain and despair to reclaim her life. “When I first read 'Whatever You Love,' I could really identify with the protagonist,” she said. “I read it cover to cover. When I finished, I said ‘Whoa!’ because I really saw myself and my own experiences in that story, and I didn’t feel so alone anymore. “A few months before that, I had read through all the journals I wrote when I was processing what it was to be sick. I saw in the narrative of the book the same ideas I saw in my journals. Back then, I couldn’t figure out how to move forward, even though I knew I had to if I had any hope of feeling like a person again. But it’s pretty simple, really. She started by dragging herself to class at Germanna. Then she made her own wish come true. Germanna's MeCANical Engineering team won the Engineering Ingenuity award this week during a contest sponsored by Stafford County Schools and 99.3 The Vibe. 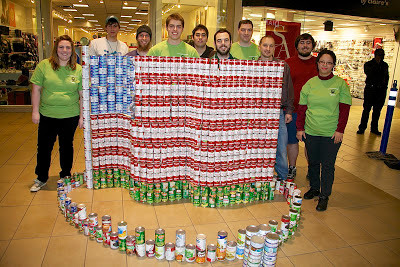 Ten teams collected thousands of cans of food for the Fredericksburg Food Bank, then built structures at Spotsylvania Towne Center. 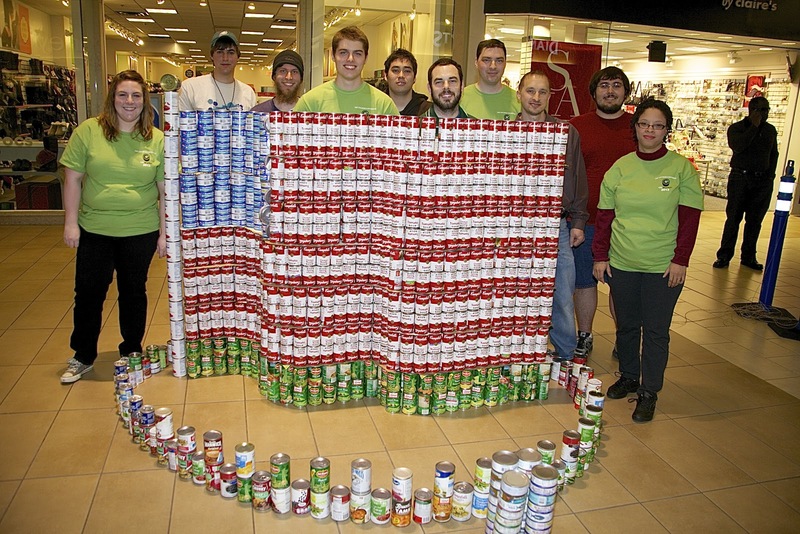 The Germanna Engineering students' American flag design was titled "Silver Linings." Now all the cans go to feed area families in need. 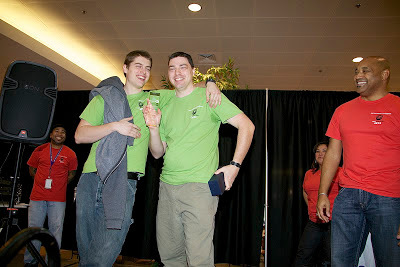 Germanna engineering students Tyler Moore and Brian Keefer accept award. and faculty advisor Davyda Hammond. Sarah Kaufman, Tyler Moore, Philip Olson and Brian Keefer. 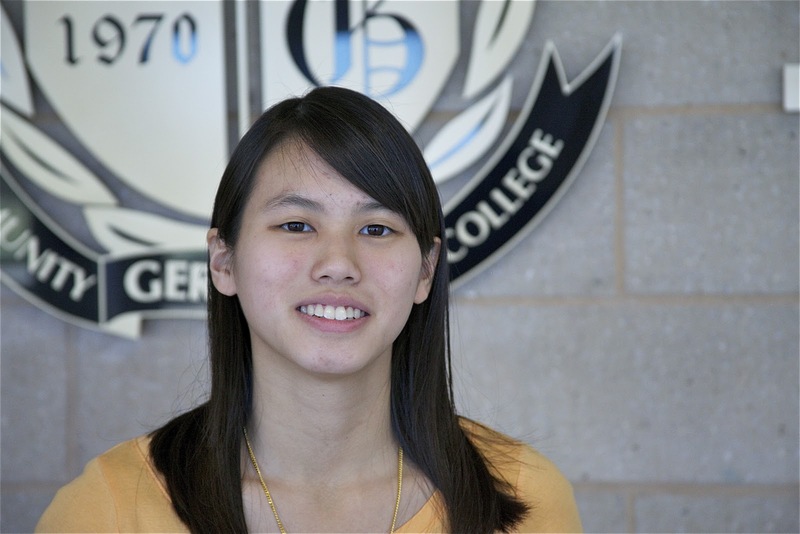 Unlike most 18 year olds, Michelle Ly graduated from Culpeper High School in 2012 with no doubt in her mind what she wanted to do. She has a gift for math. “It’s always come easily for me,” she said. Scholar based on her work at CCHS. The Commonwealth Legacy Scholarship Program awards scholarships to first-time students attending one of Virginia’s 23 community colleges, providing $3,000 for a full-year of tuition, books, and fees. It starts with one can... To feed the hungry. To lift the spirit. To change the world. 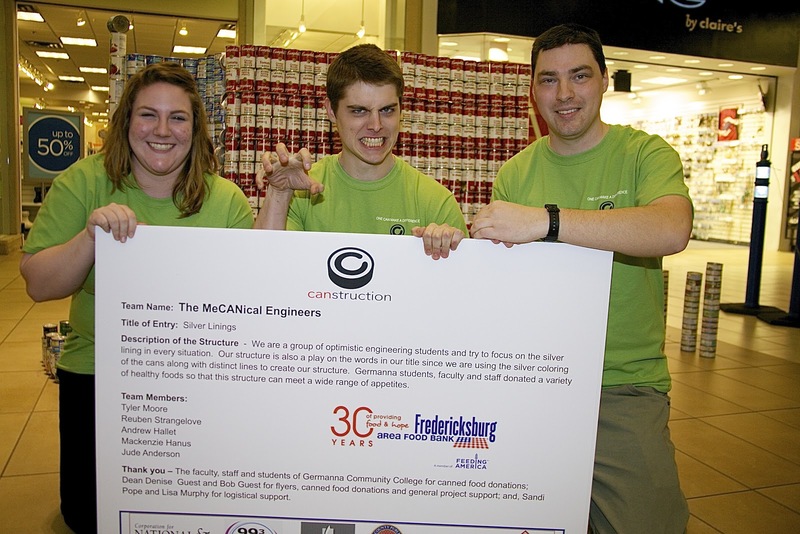 This week you can help Germanna Community College's Engineering Department and feed the hungry in our area at the same time. 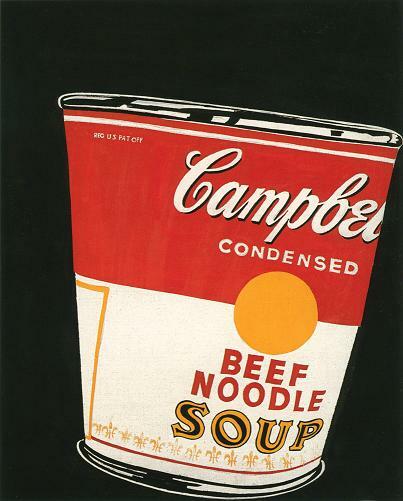 Please bring cans of food to either the Fredericksburg Area Campus in Spotsylvania County or the Locust Grove Campus. Collections boxes are located by the elevator in the Science & Engineering Building and Information Commons at FAC and in the LGC student lounge. Germanna's engineering students have entered a contest sponsored by Stafford County Schools and 99.3 The Vibe. in which they will use the cans we collect to build a structure. 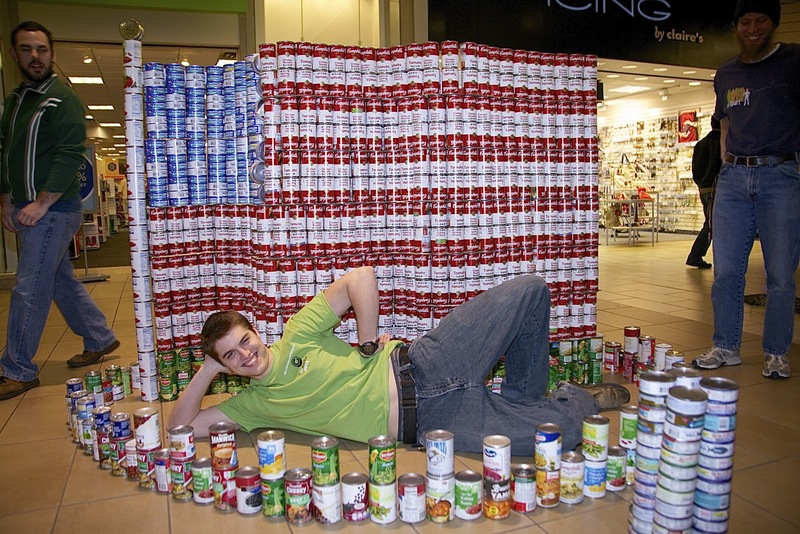 Once completed and judged, all the cans go to the Fredericksburg Area Food Bank. The contest is this weekend at the Spotsylvania Towne Centre. 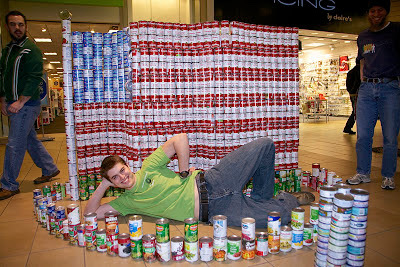 The engineering students needs 2,000 cans. Please help. He made his own focus working and going to church. But the man known to friends as Rob Lew wanted to make a difference, and he realized that to do that, he’d need to go to college, got a federal grant and enrolled at Germanna Community College last fall. “It’s a blessing to me to be able to be here and be able to get my education and I’m going to try to make the best of it,” the 26-year-old Chancellor High School graduate says. He recently attended a student leadership conference in Roanoke, where he was encouraged to reach out to faculty members. At the conference, Robert heard a speaker talk about facing one’s fears. “Whatever it is holding you back, just face it," he says he was told. 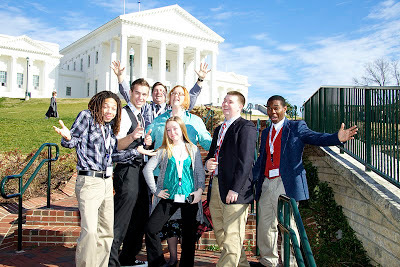 Students were encouraged to become more involved. He has. 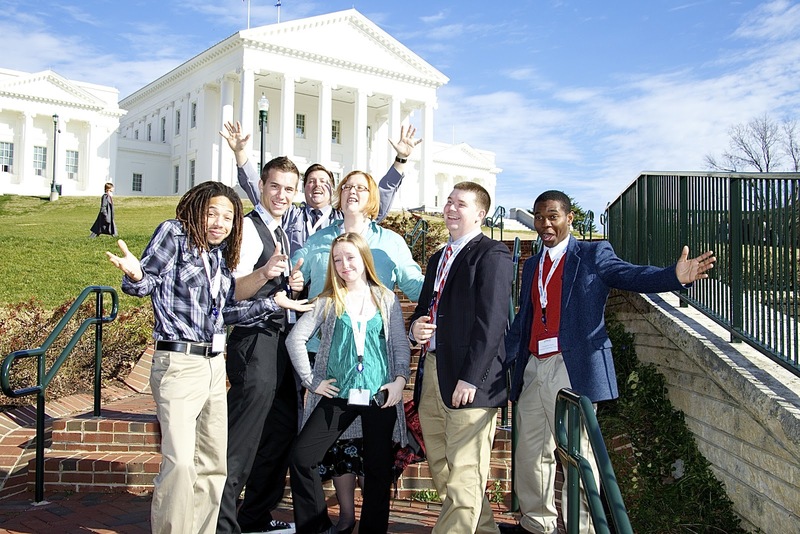 Last week he was part of a student delegation from Germanna lobby legislators to keep higher education affordable and accessible on Every Day is Community College Day at the General Assembly. lobby legislators at the General Assembly. Robert has also gotten involved as president of the Germanna Poetry Club. When he started at Germanna last fall he was planning to go into psychology. He’s had a change of heart. Now he wants some kind of career in communications, he says. 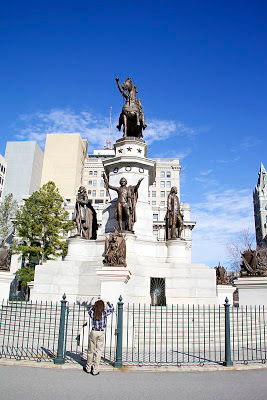 He plans to transfer to Virginia Commonwealth University. 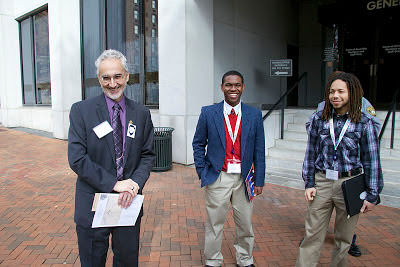 Robert Lewis during visit to state legislators last week. He already volunteers with the Red Cross and RCASA. He’s a mentor and a Big Brother. Robert said Germanna psychology Prof. Gayle Wolfe has made a difference in his life and those of other students. his phone during legislative visit last week. Your student ID number is on the card for your reference, which is useful among many different departments at Germanna. You can ride the Fred Bus for free with an updated Germanna ID, and various restaurants, movie theaters, sporting events, stores and services offer student discounts with a Student ID card. If you have received a Germanna in the past 2-3 semesters, you simply need a new “Spring 2013” Sticker for your ID. Otherwise there is a $5 replacement fee if you've lost or damaged your card. The spring stickers will be available starting Monday the 7th at Locust Grove Campus (LGC) and Fredericksburg Area Campus (FAC). For Daniel Technology Center (DTC) and Stafford County Center (SCC) students, the stickers will arrive the middle of the first week of class. Below are the pick up locations for each campus/site (also where you can find “Spring 2013 Stickers”). Once you take the photo, it will take up to a week before becoming available for pick up. An alternate form of photo identification AND your Spring Schedule will be required when picking up your Germanna ID (These are not required during photo sessions). David Broadhurst started up the National Geospatial Intelligence Agency’s own college, helping to mold the futuristic intelligence and Homeland Security operatives who use satellites, drones, pixels, computers and war games to guard against threats. Broadhurst’s job was to “enhance” 5,000 NGA employees. Now he’s taken what he learned doing that and is applying it to intelligence and homeland security training at Germanna Community College’s Center for Workforce & Community Education. He’s helped Germanna’s Center for Workforce build a program that includes courses in Critical Infrastructure Protection, Cyber Security, Risk Assessment & Management, Terrorism and many more. “We have a stable of instructors, all senior intel folks, who are very well qualified,” Broadhurst said. There's an introductory course about terrorism. Broadhurst said the target audience includes adults with degrees who are seeking to add credentials that will help them get jobs in the intelligence community, and in homeland security, both public and private; military personnel making the transition to the private sector; and young people seeking to begin careers related to national security. Germanna Vice President of Workforce, Community and Institutional Advancement Jeanne Wesley said intelligence and homeland security training offers a path to career-switchers asking, "How can I take my life skills and what I've learned in the past and package them in a way that helps?" They can quickly add valuable skills that are in demand. There will be a course that focuses on the fundamentals of advanced geospatial intelligence, an introduction to reconnaissance and surveillance, homeland security vs. intelligence, protecting critical infrastructure and protecting key resources from attack and on dealing with natural disasters-- leading to FEMA certification, he said. A course on risk assessment prepares students to deal with hazards and threats, Broadhurst said. Cyber-attacks are now considered by some to be the most grave threat to national security. Secretary of Defense Leon Panetta has warned Congress that “the next Pearl Harbor” is likely to be a cyber-attack. Companies government agencies around the region must fend off such attacks, and cyber security certification is part of the new Workforce program. Germanna also offers a for-credit cyber-security class. Go to http://www.germanna.edu/Academics_And_Student_Services/Class_Schedule/?type=noncredit or call 540-891-3012 for more information and to register. This is a two-day course for either new or relatively new analysts who have had little hands-on experience in the skill areas described in the course title, or for analysts who want to improve their analytical writing skills by giving them more focus. Much of what is required for good analytical writing takes place before the analyst actually begins to write. The scoping and planning of the intelligence analysis therefore are major areas of emphasis in this course, as well as issues of format, length, word selection, etc. The course is designed to get analysts off to a good start in as little time as possible, recognizing that there are important time constraints in such training and that much will also be learned on the job. This course allows analysts to be more effective communicators sooner. Examine the intricacies involved in the protection of key resources and critical infrastructure affected by terrorist or natural disasters. Focal areas include impacts to: transportation systems, communication systems, emergency services, and government/business operations. As part of this course, individual FEMA certification, IS-0821-Critical Infrastructure and Key Resources and IS-00860 - National Infrastructure Protection Plan is obtained. This class is held at the Stafford Technology and Research Center located at 800 Corporate Drive, Suite 315, Stafford, VA 22554. This class is also available online for $1700. For more information about this online class, please visit www.contentlogistics.com/germanna. This course is geared to both the new or journeyman-level analyst who has had little formal training or hands-on experience in critical thinking, or for the more experienced analysts who wants to improve his or her critical thinking skills. This course focuses on a key aspect of analytic tradecraft, the ability to think through series of conflicting and competing data, but doing so in a manner that is self-aware of the quality and integrity of the thought process. This course is specifically designed to reflect the standards for analytic integrity and tradecraft as prescribed by the Office of the Director of National Intelligence (ODNI) in Intelligence Community Directive (ICD) 203 + which are useful for both government and private sector analysts. Using case-based discussion leadership as the main teaching methodology, augmented by several facilitated discussions, this seminar introduces the students to (1) intellectual traits useful in critical thinking as well as the barriers to critical thinking; (2) structured analytic techniques; and (3) allows the students to apply ethics in analysis. This course is designed to introduce a proven critical thinking model and allow the analysts to put this model into practice immediately against relevant problems in the safe environment of the classroom. This course includes hand-outs and pamphlets for the students, and the use of graphic recording to capture key concepts and assist the analysts in visualizing and retaining the information provided. Riverside Research offers an introductory, non-technical AGI course that provides insight into this challenging, sophisticated discipline. AGI offers tremendous potential against a diverse array of national security threats, humanitarian issues, and environmental situations. AGI-oriented analysts exploit this capability quickly due to quantum improvements in data processing, advanced software tools, and new sensor developments. Students are introduced to the two sub-disciplines of MASINT that comprise AGI: radar and electro-optical (EO) , including OPIR. You'll learn about the AGI community and its history. You'll gain an understanding of basic AGI capabilities along with real-world applications and signatures, and you'll participate in a discussion of AGI products. BUSC 2617-20 is located at the Stafford Technology and Research Center located at 800 Corporate Drive, Suite 315, Stafford, VA 22554. Get an overview of the U.S. Department of Homeland Security (DHS) focusing on: the National Strategy for Homeland Security; contemporary and historical lessons learned; interaction of private/public sectors, military, and State governments as they relate to Homeland Security; communications, intelligence and information sharing; homeland security technology; and civil liberties and security. This class is also available online for $1700, course number BUSC 2583-I1C. For more information about this online class, please visit www.contentlogistics.com/germanna. Riverside Research presents an introduction to the presentation skills and research methods commonly used to develop intelligence products. This course covers basic concepts, including a background survey on the processes used for briefing intelligence topics, as well as adherence to community of practice standards required by the Office of the Director of National Intelligence. This course provides an understanding of how to construct and execute a presentation (briefing) that is composed of sourced technical intelligence. How to Brief Like an Analyst presents a broad spectrum of briefing topics and situations that analyst may face as an intelligence professional. This course provides an exploration of how specific techniques and decision rules can be used to help maximize reliability of finished intelligence products. Students will also understand the usefulness and applicability of the different categories of intelligence briefings used when presenting intelligence-related information to decision-makers. Riverside Research offers an introductory, non-technical course that provides students with the opportunity to gain a good understanding of the entire United States Intelligence Community (IC) and to learn about its diverse roles and varied mission as related to U.S. policy, national defense, and homeland security. Riverside Research offers a classified course that introduces current and future sensors used for ISR. These sensors include traditional imaging sensors in the visible, infrared, and radar; spectral and polarimetric imaging sensors; and persistent surveillance sensors in the visible and infrared. Not included are SIGINT sensors or non-electromagnetic sensors, such as seismic. Students will spend one day surveying the electromagnetic spectrum, platforms, applications, visible and infrared sensor data collection techniques, radar collection techniques, and other technical issues. In the remaining two days, each of the sensor types listed above will be explored in terms of current sensors grouped by altitude regime; capabilities and applications,; tasking, collection, processing, exploitation, and dissemination (TCPED) agencies; sensor trends; and future systems. Riverside Research offers a one day classified seminar on SAR as used in AGI. SAR has been used for several decades as a means of providing around-the-clock imagery, in virtually any weather, to intelligence analysts and military operators. Non-literal AGI processing and exploitation techniques have led to even greater and widespread application of SAR to these and other remote sensing applications. This course provides a detailed look at the range of SAR AGI techniques and applications to the intelligence community and operational user. Students are introduced to the fundamental principles of SAR and its use in AGI. Topics include:(1) Basic radar operation; (2) SAR data collection; (3) SAR scene generation; (4) SAR AGI products (Coherent Change Detection, Digital Elevation Models, Dynamic Imaging); (5) Creation of SAR AGI products; and (6) The limitations of SAR. U.S. Intelligence: An Introduction provides a broad overview of the roles, functions, activities and current issues facing the U.S. Intelligence Community. This course is specifically designed to provide government, military, academic, and contractor professionals working with the Intelligence Community a firm basis for understanding the Community+s roles, needs and culture and the issues that they are facing today as the Community deals with a new structure and new threats. This course places special emphasis on the ongoing changes in U.S. Intelligence and the issues that these changes raise, and the changes that have been implemented since 2001 and how they are progressing. In the 2-day course, U.S. Intelligence: An Introduction is comprised of the following core modules with associated learning objectives, each of which helps meet the needs noted above. Get an overview of the methodology of risk analysis to include: the best practices employed in risk management in homeland security, the indentification and analysis of and differentiation between hazards and threats, the concept of all hazards risk, the importance of the country's critical infrastructure and key resources and its vulnerability to attack the need for effective public-private partnerships for risk management in homeland security and the various government agencies involved. Also covered are various approaches to security vulnerability assessments for critical infrastructure as well as the conditions, factors, and states of existence in which it may become necessary to provide levels of countermeasures for remediation efforts. The course provides a fundamental understanding of what is involved in securing an organization's or an industrial sector's infrastructure. This class is also available online for $1700, course number BUSC 2582-I1C. For more information about this online class, please visit www.contentlogistics.com/germanna. An introductory look at the roots and evolution of terrorism as it affects homeland security today. Emphasis areas include: asymmetric threats in today's world; history of modern terrorism; exploratory of major terrorist organizations; role of the media; terrorism tactics and counter-terrorism policies and strategies. An overview of the U.S. Department of Homeland Security (DHS) focusing on: the National Strategy for Homeland Security; contemporary and historical lessons learned; interaction of private/public sectors; military; and State governments as they relate to Homeland Security; communications, intelligence and information sharing; homeland security technology; and civil liberties and security. Focus on key training and career paths for Homeland Security Professionals. Introduction to exercising and evaluation tools including: overview of HSEEP, exercise design, development of exercise evaluation guides, homeland security training program design. As part of this course, individual FEMA certifications, IS-00100 and IS-00200 - Incident Command System and IS-00700 - National Incident Management System will be obtained. An overview of the methodology of risk analysis to include: the best practices employed in risk management in the world of homeland security, the identification and analysis of and differentiation between hazards and threats; the concepts of all hazards risk; the importance of the country's critical infrastructure and key resources and its vulnerability to attack, the need for effective public-private partnerships for risk management in homeland security and the various government agencies involved in risk analysis and mitigation. Also covered are various approaches to security vulnerability assessments for any critical infrastructure as well as the conditions, factors and states of existence in which it may become necessary to provide levels of countermeasures for remediation efforts of identified vulnerabilities. The course will provide a fundamental understanding of what is involved in securing an organization's or an industrial sector's infrastructure.